Slow-roast a vegetable side dish for dinner tonight. The garden-fresh vegetables in this tasty side dish get a boost of flavour from KRAFT Dressing, while roasting them in the oven brings out their natural sweetness. 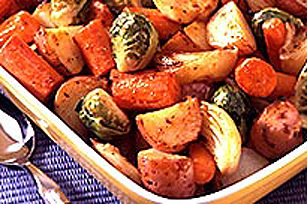 Combine 3 each cubed carrots and parsnips and 1 lb each mini red potatoes and brussel sprouts with 3 Tbsp water in a large microwavable bowl. Microwave on HIGH for 10 minutes. Pour vegetables into a 9 x 13 inch baking dish; add 2 peeled and quartered onions and stir in 1/2 cup Kraft Sundried Tomato and Oregano Salad Dressing. Bake, uncovered, at 450°F until vegetables are tender or about 30 min.